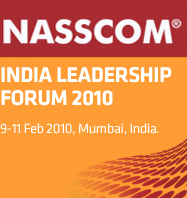 The just concluded "India Leadership Forum 2010" conference held by NASSCOM in Mumbai, India brought together technology & IT services gurus and outsourcing & globalization pundits from all over the world to the Grand Hyatt for three days in the second week of February. This event is arguably the largest gathering of technology executives and was attended by over 1000 delegates representing multiple countries from across the globe. The underlying theme, like many other similar industry events was - you guessed it - "Change & Innovation". As we all know, the words change and innovation has been overly used and abused by corporations trying to monetize its agendas by coupling their message to these words, that it lost its meaning. However, this time around, it did seem very real that the world of outsourcing and IT services will actually see some quantifiable process changes. I believe that the following phenomenon will be evident this year. Cloud and SAAS are more real than ever: Although we have been seeing bits and pieces usage of cloud computing this past year or so, it is becoming more of a reality this year. The mystic on cloud is definitely being more revealed. Simplistically speaking, customers are seriously looking at reducing their capital expenditure (CAPEX) by depending less on capital heavy infrastructure portfolio. According to Wikipedia, cloud computing is a paradigm shift whereby details are abstracted from the users who no longer have need of, expertise in, or control over the technology infrastructure "in the cloud" that supports them. It is a new supplement, consumption and delivery model for IT services based on the Internet, and it typically involves the provision of dynamically scalable and often virtualized resources as a service over the Internet. The CXO's of the major service providers present in the NASSCOM sessions definitely showed a willingness to promote this technology. As a derivative result, there will be more uptake of software as a service (SAAS) and application as a service. Companies will also want to utilize the full benefits of cloud by availing the application based services that traditional installed software's provide. This will again drive costs down significantly by eliminating software install and maintenance charges. SAAS will probably become a mainstay in any managed services engagement model for delivering IT services. Broader usage of new age pricing: As I wrote in my recently released book on finding, structuring and delivering globally deployed IT services & outsourcing deals - "Winning Strategies: Secrets to Clinching Multimillion-Dollar Deals" John Wiley & Sons, 2010, the world of IT services and outsourcing pricing is about to see tremendous amount of changes. Linear pricing of equating more full time resources (FTE's) with more work is changing quicker than we can imagine. Technologies like cloud computing are encouraging customers to venture more into outcome based pricing. This simply means that service providers take full responsibility of delivering outcomes. The "how" and "where" mechanics of delivery will be controlled by the service provider to a greater degree than before. This is a major shift from traditional price plays. Leveraging offshore capabilities simply as a labor arbitrage ploy will not cut it anymore. All major global and Indian pure plays recognize this and are working hard to process designs to effectively accommodate this new turn of direction. The ability to provide full managed services or variations of managed services with outcome based service level agreements (SLA's) will be critical for service providers that want to win in this new world order. India as a consumer of services: India is known to the world as an IT and BPO service delivery hub. But, it has recently become quite a consumer of services. The public sector unit (PSU) in India has opened the kimono and major deals are in the works in the next 2 to 5 years. The private sector is also not too far behind either. Needless to say, all major service providers are seriously implementing a "sale in India" strategy whether it is strategic or opportunistic. Vertical expertise is a must: Simply being a quality system integrator (SI) or providing superior technology support is not enough anymore. Companies need to definitely have the technology capabilities but should have vertical centric offerings, history and frameworks to truly capitalize in today's market. Today customers expect SI's to provide not just direct technology benefits but help them actually strengthen their positions in their own verticals by bringing in superior capabilities. Relevant, responsible and secured outcome delivery: The ability to quickly deliver relevant customer requested outcomes and present them in multiple formats quickly and effectively will be crucial for the service provider's success. The delivery mechanism should be environmentally responsible (read less utilization of CAPEX heavy energy dependent infrastructure) while having the ability to provide a common security framework across platforms. With all these changes in the fray, this year will be a very interesting year for both the customers and the services providers who are both trying to recover from the economic downturn by being innovative in their consumption and sales approach. Will these new directions turn into actual monetary gain for service providers? Well, personally, as I am prospecting customers, I am seeing more interest in transformation discussions than last year. I am hopeful that this year will be a better year than last for all of us in the service delivery business. Anirban Dutta, a director at CSC is proficient in helping grow IT service delivery organizations. As a key member of a strategic deals group, he played a major role in helping a particular service delivery provider grow its top line from $1 BN to $2BN in 2 years. He is the co-author of a leading book on IT services and outsourcing deal making called "Winning Strategies: Secrets to Clinching Multimillion-Dollar Deals", John Wiley & Sons, 2010. He tweets @ www.twitter.com/duttaanirban1. Note: All viewpoints depicted in this article are mine and in no way or form represents the viewpoints of my present employer, former employers, present and past customers and collaborators.